Late starter Simon Thornton is just six rounds away from going from weekend hacker to European Tour star. The Royal County Down based Yorkshireman, 31, only took up the game in his late teens but today finds himself battling with 155 other hopefuls for just 30 European Tour cards at the Qualifying School Finals in Spain. It’s been an amazing journey for Thornton, who joined Royal County Down professional Kevan Whiston as an assistant 12 years ago and never looked back. With four wins on the PGA Irish Region this season, Thornton finished fourth on the domestic Order of Merit behind John Kelly, Philip Walton and Robert Giles. But after battling his way through the first two stages of the Q-School, he’s determined to finish off the year in style alongside Ulstermen Michael Hoey, Michael McGeady and Jonathan Caldwell at PGA de Catalunya near Girona. Already guaranteed a Challenge Tour card for 2009, Thornton reckons he has the game to compete at the highest level. Hoey and McGeady claimed titles on the Challenge Tour this season and while they failed to finish inside the top 20 in the rankings who earned automatic promotion to the European Tour they have a second chance this week. 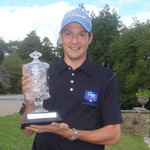 The Q-School finals are a new departure for 2007 Walker Cup star Caldwell from Clandeboye, who has turned professional after helping Ireland win the amateur Home Internationals and the European Team Championships this year. Starting today (Thurs), the 156-man field will play two rounds over the Red and Green courses at PGA Catalunya with the top 70 and ties after 72 holes qualifying for the last two rounds of the 108-hole marathon. At the end of six rounds, the top 30 and ties earn European Tour membership and a chance to join Padraig Harrington and Co in the €20 million Race to Dubai. Walker Cup ace Caldwell only joined the paid ranks when he guaranteed himself Challenge Tour status by coming through Stage Two of the Q-School last Saturday. Challenge Tour trio Colm Moriarty, Simon Thornton and Jonathan Caldwell remained on course to make next week's final stage of the European Tour Qualifying School in Spain. Almost 300 players are battling for 74 places in the finals at PGA Golf Catalunya at four second stage venues but nine of Ireland's 12 hopefuls are in danger of missing out. Murphy incensed by slow play - "I wanted to smack both of them"
Gary Murphy confessed that he wanted to “smack” the slow coaches who have almost wrecked his bid to win back his European Tour card. 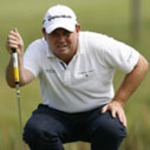 But the 37 year old Kilkenny man still has a fighting chance of a tour return after a battling 69 left him two shots outside the top 30 and ties entering the sixth and final round of the gruesome Qualifying School finals at PGA Golf de Catalunya. On a sun-kissed winter's day when Simon Thornton (67) moved into the top 30 and Niall Kearney slipped to 50th after a 74, Murphy did well to keep his cool and pick up six birdies after three dropped shots in the first two holes. “The pace of place was a disgrace,” Murphy said. “Most of the guys here haven’t a clue and it was the same yesterday. Fairytale story for Simon ThorntonGary Murphy and adopted Irishman Simon Thornton survived a nerve racking final day to earn their tour cards at the European Tour Qualifying School finals at PGA Golf de Catalunya. Murphy, 37, fired a brilliant four under par 68 to finish a shot inside the top 30 and ties on 11 under par and secure the 17th of 31 cards after six rounds.